Hank Mondale is a rough and ready P.I. who likes to drink and gamble more than he should, a lifestyle choice which has led to his landlord threatening to evict him and bookie threatening a great deal worse, he desperately needs a break. When the real estate mogul Thomas Blake calls with a paid job opportunity he jumps at the chance, even though the particulars are a little odd - a "monster" trying to kill Blake's daughter and people around her are "disappearing". Is the wealthy brat a murderess or is there really something strange going on? There is a really great hard-boiled private detective edge to the narrative which is coloured by the New York City dialect and provides a strong edgy voice that helps to flavour this dark fantasy tale. Hank himself is a quirky, less than perfect detective who's redeeming features appear to be his dogged determination and fearlessness, with a dry and subtle humour. He's a very interesting, if a little clichéd character that has been very well drawn and easy to like. The story switches between the first person perspective of Hank and that of the Monster he is tracking, about half way through the book and the transformation is quite acute with a very different style which acts as a pretty strong juxtaposition to the hard-boiled theme of the first half. This change is so strong that for me it didn't work, I was quite enjoying the detective style and to suddenly move away from this just felt wrong. As such it took me quite a while to adjust to the new perspective and even when I did I felt it really grate on my nerves. Due to at least 30% of the novel being taken up with this viewpoint there is no time left to pick up on any further detective work and the end seems a little premature and rushed. I do think that the idea of looking at the same story from opposite viewpoints was a good one but I feel that to carry it out the book did really need to be a bit longer and more time spent with the investigations of Hank. The quality of the prose is however excellent and the pace pretty fast paced while overall it is quite an interesting plot. 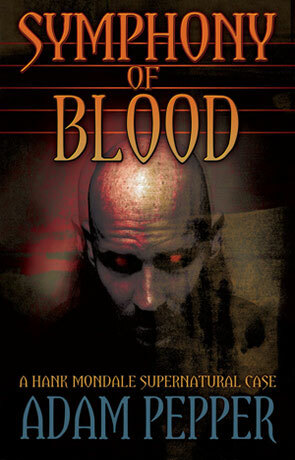 Symphony of Blood has some great dialogue and interesting ideas but for me the vastly different styles from the opposing viewpoints didn't work and the subsequent ending felt incomplete. I would love to see the author write a more dedicated hard-boiled science fiction story without the horror angle but in the meantime Symphony of Blood remains too miss-matched to really deliver it's message. Written on 9th December 2011 by Ant.